Anticipating a move with your pets? Here's what I learned during my recent move. 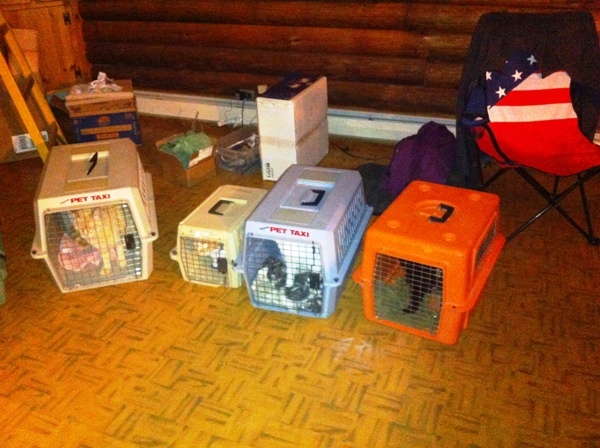 Recently we moved across the country with six cats (one feral) and a dog in tow. We drove two fully loaded vehicles. While I was very excited about the move, I worried about the impact on the animals. Would they make it? What about bad weather? Food? Staying hydrated? We planned to make the trip in two days, for the sake of the animals, but I should have known better. We ended up taking three days to make the trip and it was very tiring for the humans (we took a longer route than usual, and we probably worried a bit too much). However, the animals did just fine. I had never made a move like this before. Here are my observations about what worked for the cats and what I learned if I have to do this again. Immediately before and during the drive, I fed the cats canned food. I would give them very little in the morning and more at night when we arrived at a motel. 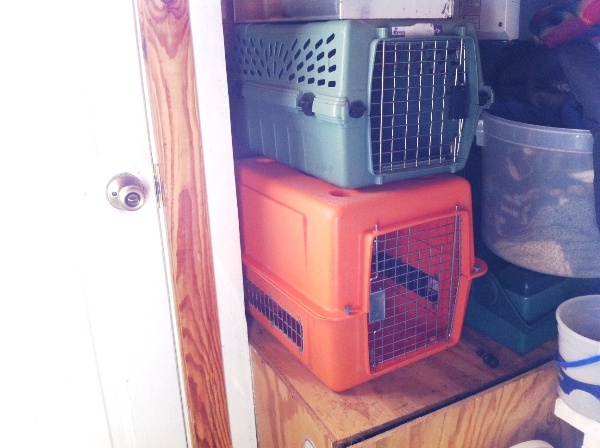 I figured that the cats might not be drinking as much as they should, given that they were crated in vehicles for the entire day of driving. This feeding routine worked well for my cats, and I only had one accident among six cats over three days. The cats seemed to have a good appetite at night, once we reached our hotel. Our original plan was to stay at a La Quinta in Toledo, the halfway point of our trip. La Quintas are pet-friendly, though each property varies in the amount of pets they will allow per room. 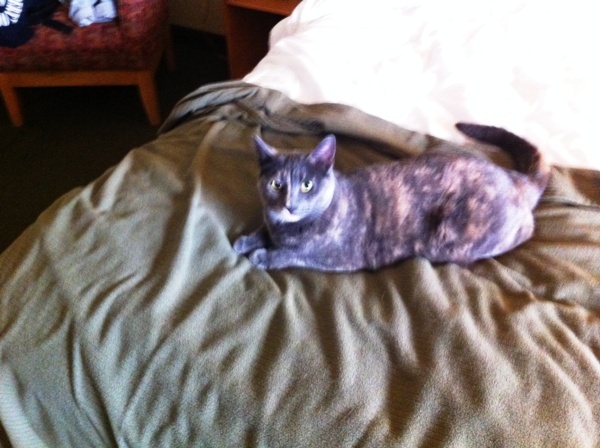 I had verified beforehand that all my cats and the dog could stay at this La Quinta, and I made a reservation. However, plans went awry and we realized there was no way we could make Toledo by our first night. We were prepared to simply camp out in the cars at rest stops, if needed, but I was really glad for the cats and dog to have a chance to get out and stretch their legs. Throughout the trip, I was completely impressed with how calm my cats were. They barely made a peep for the entire three days. They are all good riders, but I expected more protesting on such a long trip. They also really seemed to enjoy the chance to stretch out, jump around, and enjoy exploring a motel room. Their sense of fun helped me relax. My local vet had just begun selling essential oils and they suggested Peace and Calm, which is rubbed into a cat’s fur. This seemed to have really great results with keeping my cats calm. I used both Feliway and Peace and Calm prior to, throughout, and after the trip. I know that some cats would need stronger stuff, but my bunch didn’t seem to require it. We drove two vehicles. I figured the cats had enough stress and I didn’t want to stress out the feral cat (Zorro) or the others by putting them all in one car. So Zorro rode in the back with our dog, who had her own crate. Zorro had been near this dog before, and the dog is nonthreatening to the cats. I kept Zorro’s crate covered with a towel or sheet through most of the trip. Our vehicles were really almost overpacked. By the time we loaded the animals and the stuff that absolutely needed to go on this trip, there was not an inch to spare in either car. In an ideal situation, I think I would have room to help a cat use a litter box, if needed. We simply didn’t have the room. I also didn’t have harnesses for the cats, which would have been nice for either stopping to go to the bathroom or giving them a chance to move and stretch. I probably also should have been more realistic about how far we’d actually get the first day, but we did get lucky and find places to stay. Have you made a long move with animals? What did you learn? Tell us your experiences in the comments. About Catherine Holm: Told that she is funny but doesn’t know it, accused of being an unintentional con artist by her husband, quiet, with frequent unannounced bursts into dancing liveliness, Cat Holm loves writing about, working for, and living with cats. She is the author of the cat-themed memoir Driving with Cats: Ours for a Short Time, the creator of Ann Catanzaro cat fantasy story gift books, and the author of two short story collections. She loves to dance, be outside whenever possible, read, play with cats, make music, do and teach yoga, and write. Cat lives in the woods, which she loves as much as really dark chocolate, and gets regular inspiration shots along with her double espresso shots from the city.